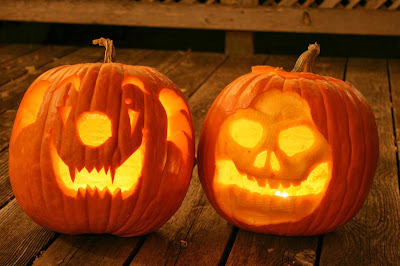 Chad and I celebrated BYOPTYOHTY by carving jack-o-lanterns Sunday night. Happy Halloween from a scary clown (aren't they all a little scary?) and the grim reaper. Sweet dreams! I doubt that we will dress up this year. Plans for two different charity costume parties fell through this Halloween season when the charities both cancelled their events. Bummer.